The market for new cars in the European Union is at its weakest in nearly two decades, and recession across much of the region could dent sales further this year. New car registrations fell more than 8% to just over 12 million last year -- the lowest total since 1995, the European automotive industry association ACEA said Wednesday. It was the sharpest decline in demand since 1993, when Europe was again lagging the world in recovering from a global downturn. December alone saw registrations slump 16%, the industry's weakest performance for the month since 2008. Of the major suppliers, U.S. and French manufacturers bore the brunt. Renault's registrations fell by almost a fifth, while those for Peugeot/Citroen, General Motors (GM) and Ford (F) were down by 13%. Demand for Volkswagen (VLKAF) brands declined 1.6%. 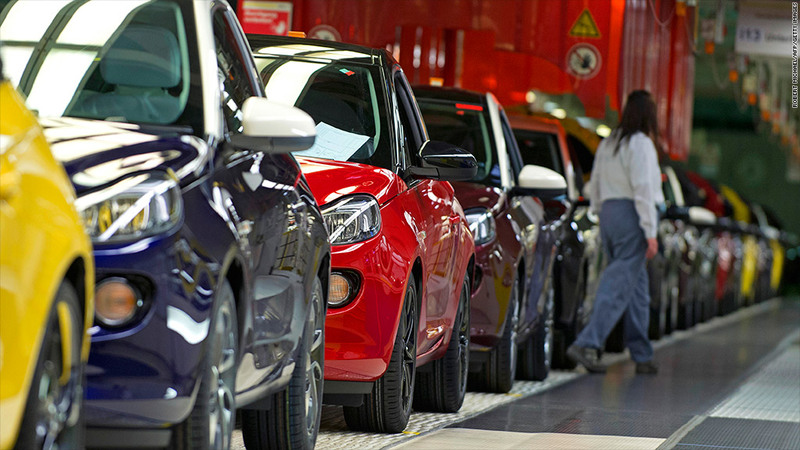 Recession in many European countries has depressed demand for new cars. Eurozone countries that have been hit hardest by the debt crisis have suffered the worst. Registrations in Greece collapsed by 40% in 2012, closely followed by Portugal, Cyprus and Italy, where they fell by 38%, 25% and 20% respectively. Analysts said the situation may be even worse than the numbers suggest. "The actual decline is much worse than the statistics would have us believe, because sales figures for the year were artificially inflated as a result of self-registrations by dealers and automakers," said Peter Fuss, senior advisory partner at Ernst & Young's Global Automotive Center. That trend was particularly marked in Germany, he said, where registrations for the year as a whole fell 2.9% as the economy was dragged down in the second half of the year by weaker export growth and an uncertain outlook for the eurozone. Carmakers in Europe have responded by offering steep discounts. Some have tried to reduce overcapacity -- Ford is shutting a plant, and others are planning similar moves or shedding jobs. But with another year of stagnation or even recession in the horizon, they're likely to make further adjustments in capacity. "The outlook for the European market remains challenging, with a further decline in sales likely," said Fuss.